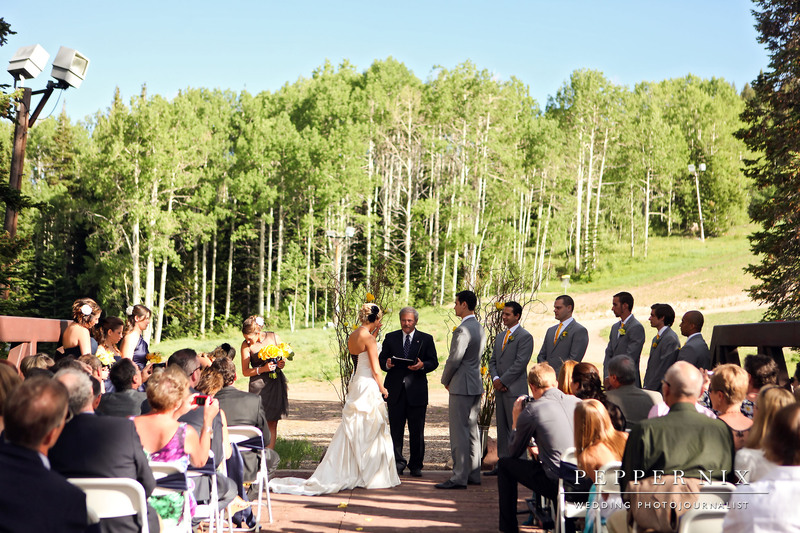 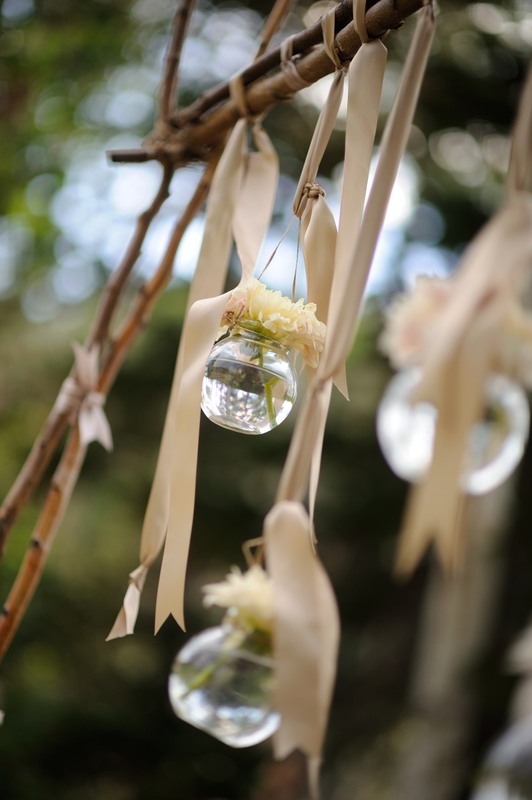 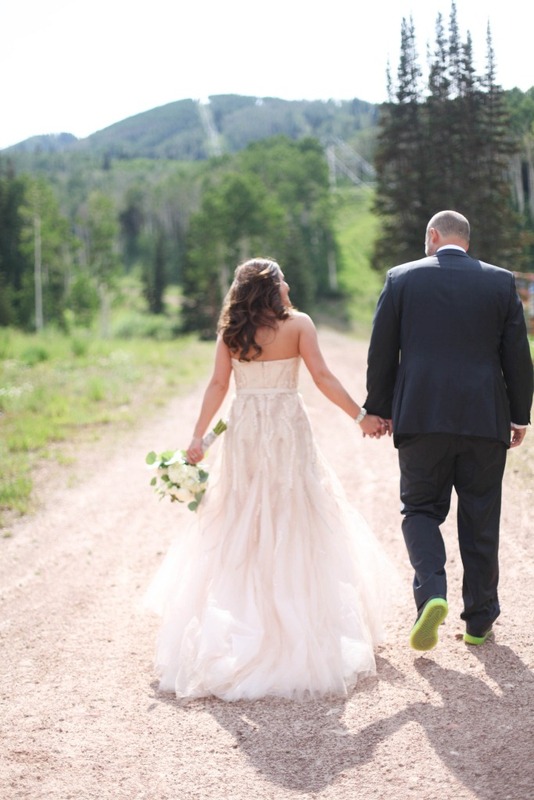 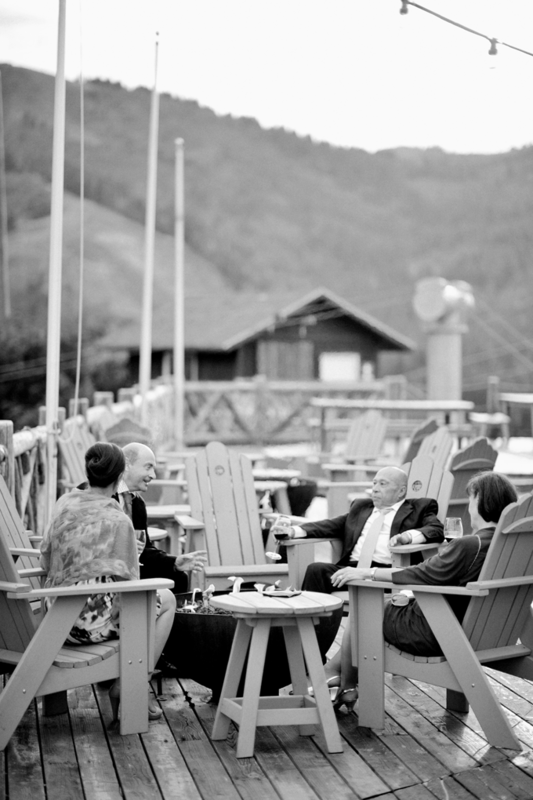 It is spring again in the mountains, and what better way to celebrate than to share an awesome wedding from June 2013. 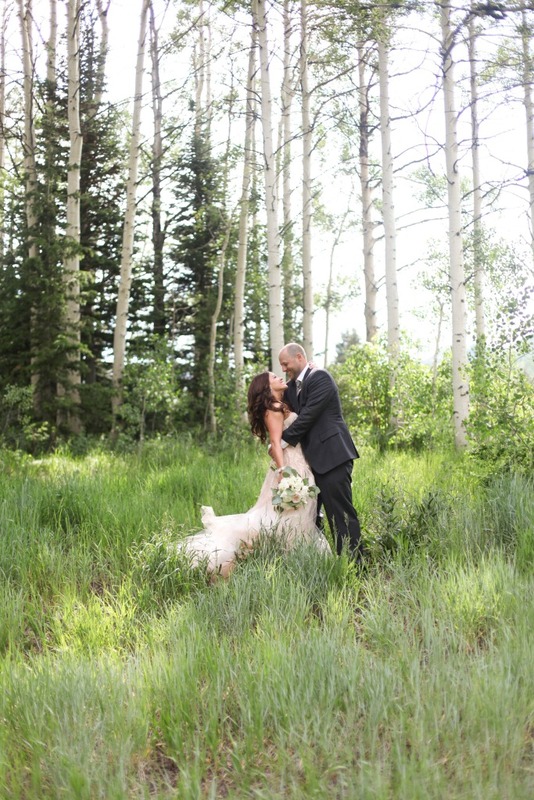 Our Canyons team worked with a fantastic couple from Chicago for this destination wedding. 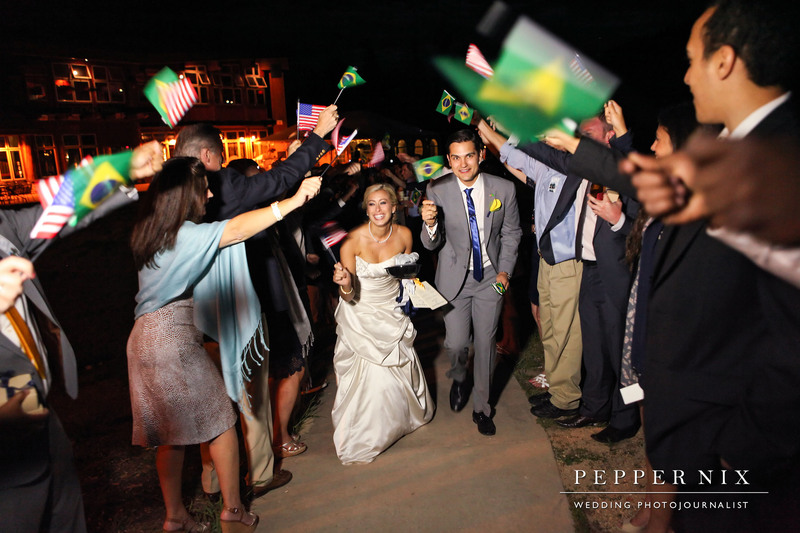 And, this was a real destination for many guests especially those one the groom’s side coming all way from Brazil. 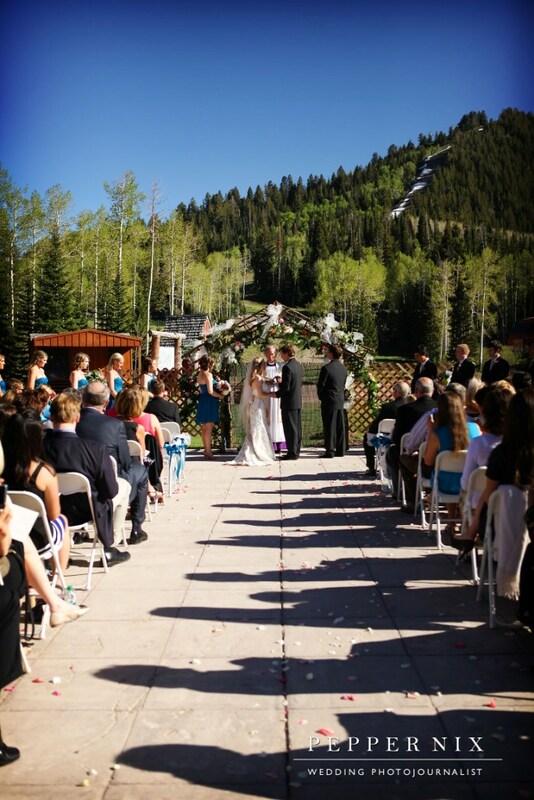 Those from the windy city and abroad were treated to a spectacular sunny day in Park City. 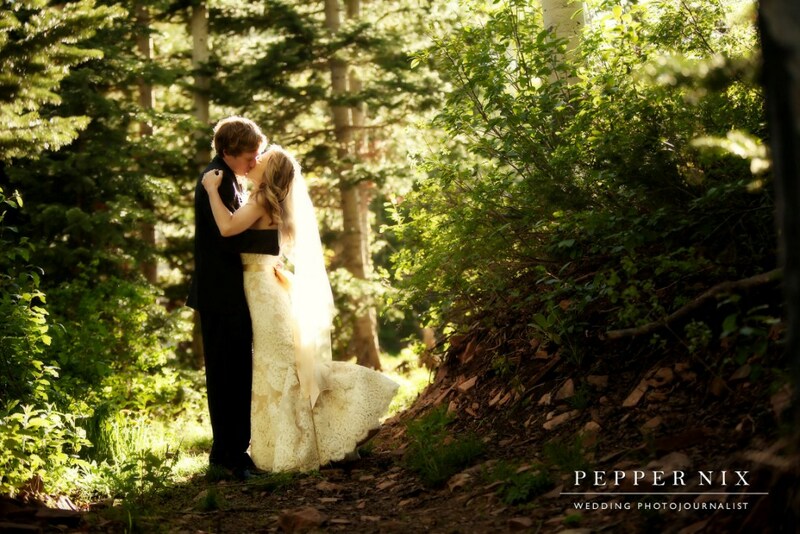 Logan Walker from Pepper Nix Photography was onsite to capture all the spring magic. 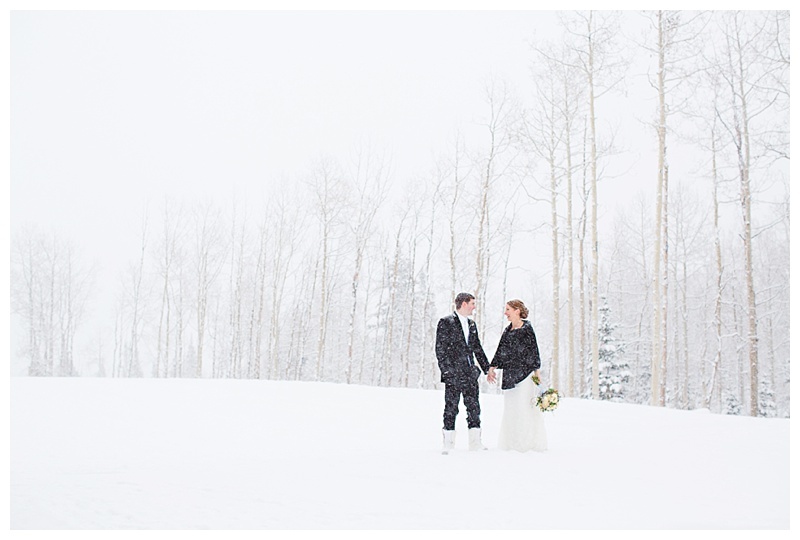 Winter destination weddings tend to be some of my most memorable over the year. 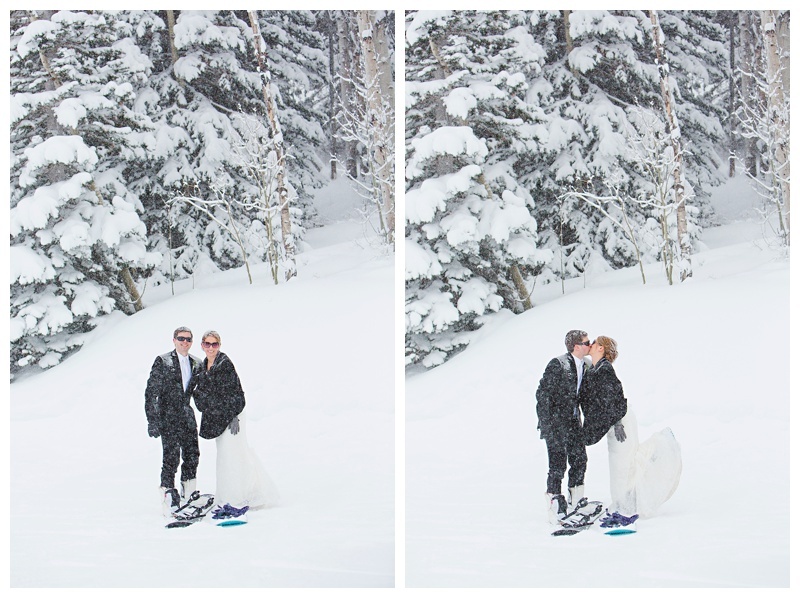 I love when couples are able to combine their personal passion for snowboarding and their passion for each other. 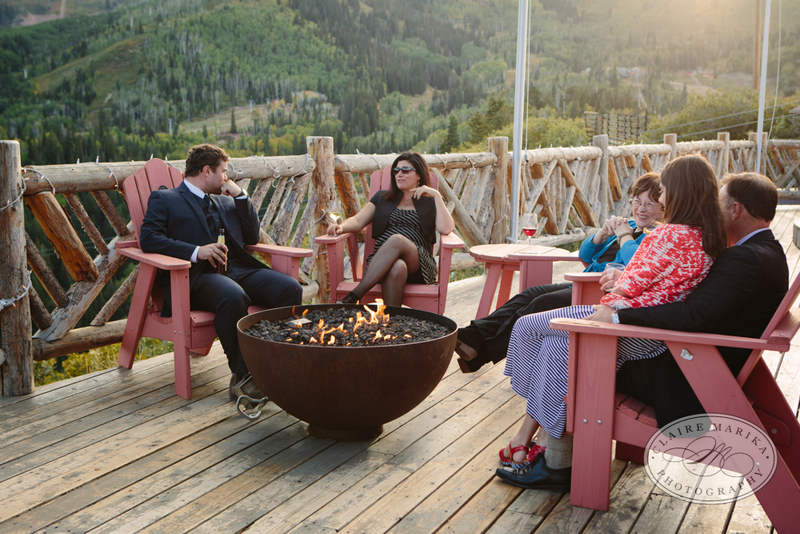 What better way to share your love of the mountains with your closest friends and family than invite them to an incredible ski resort like Canyons. 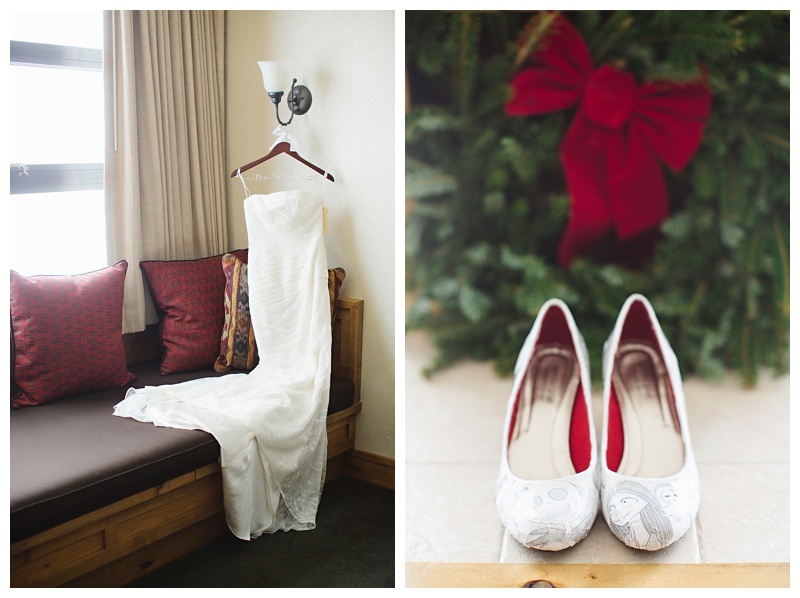 Erin and Pete exchanged vows at Red Pine Lodge this past December. 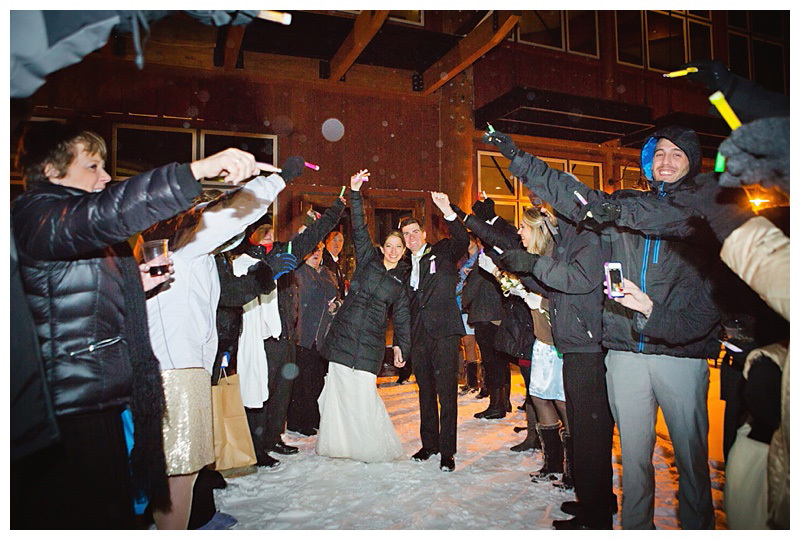 Kate Benson Photography was on hand to capture this early winter season event. 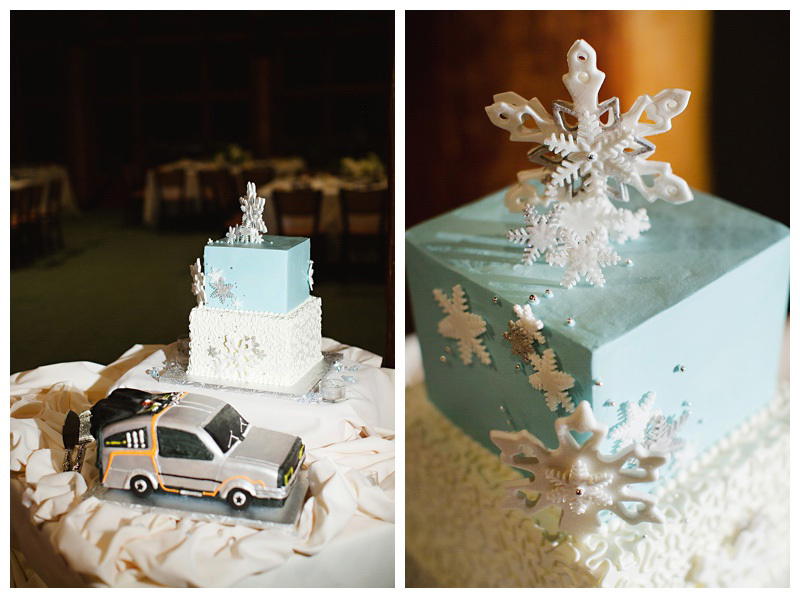 What advice do you have for future brides who are planning a winter wedding? 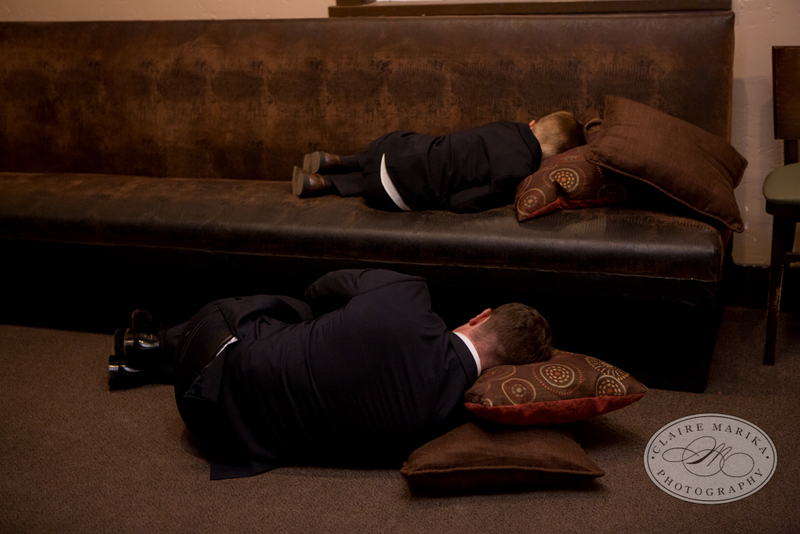 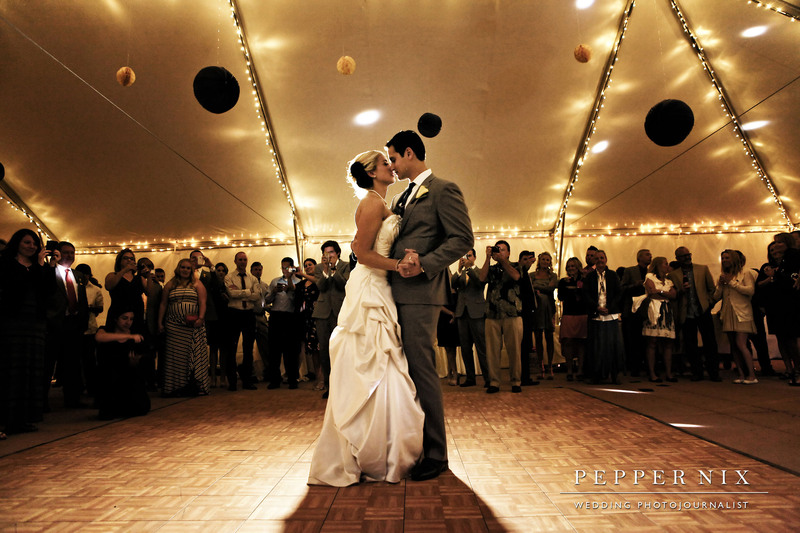 What was your most memorable part of the wedding? 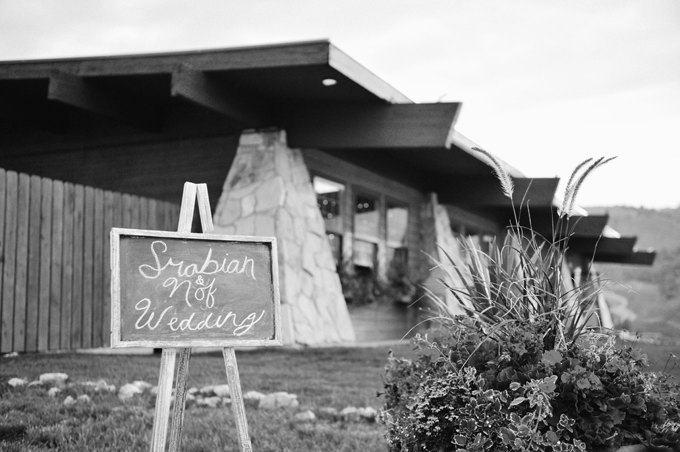 What was your favorite detail that you planned? 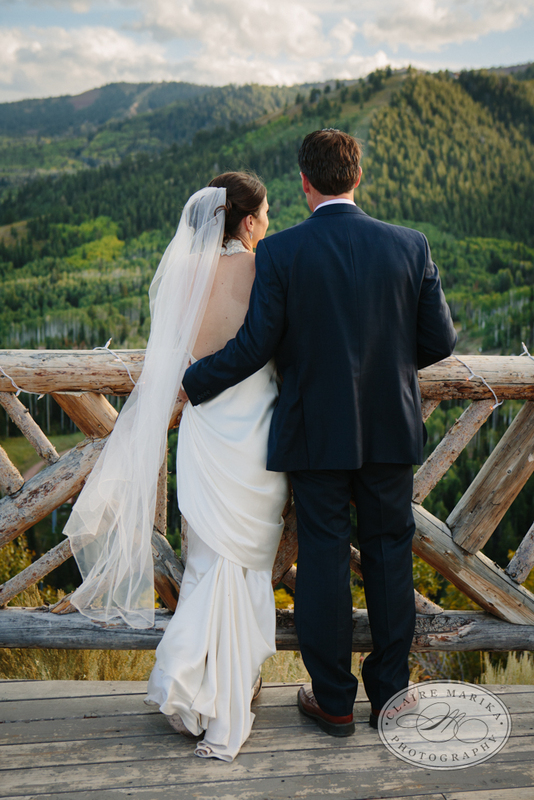 Erin told us later that she fell so in love with the mountains, that they have actually relocated to a ski town! 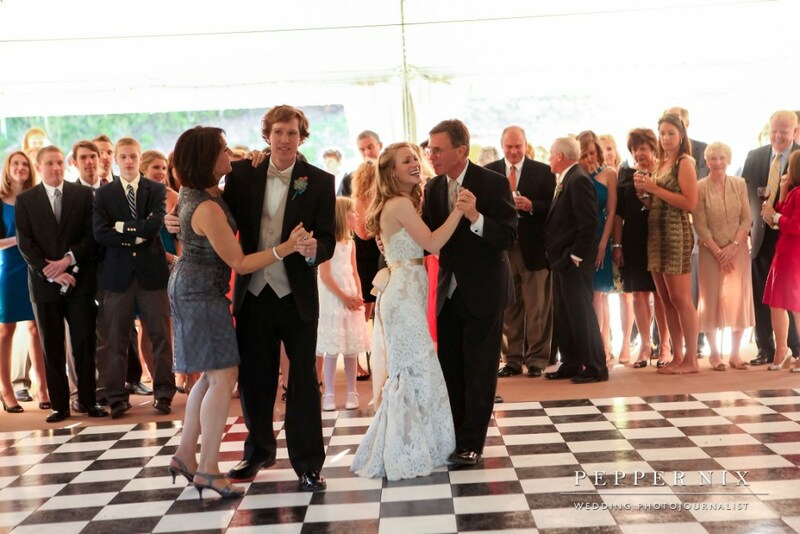 Our team had the pleasure of working with Kim and Pete, a fun and fantastic East Coast couple, over the summer. 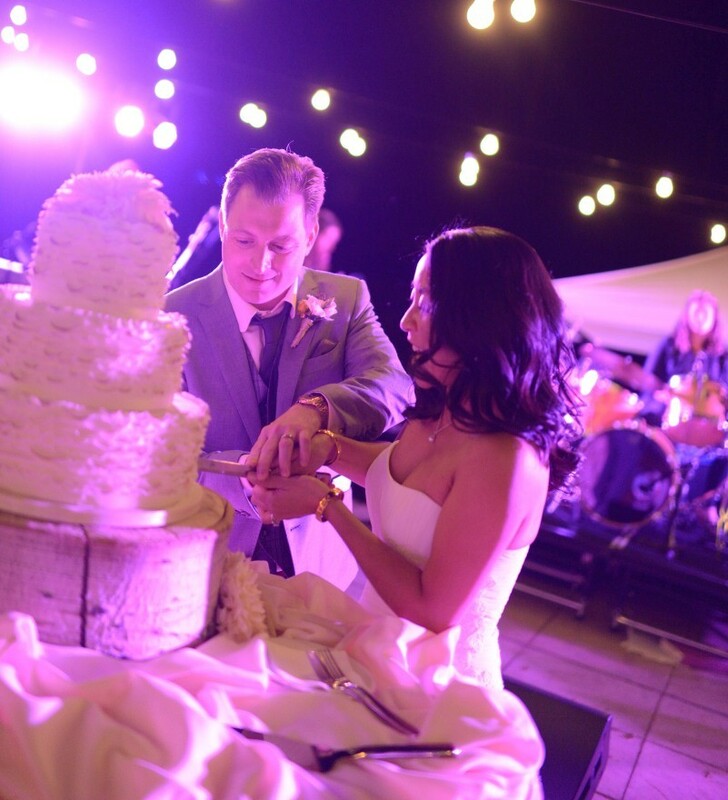 Like many of our destination couples, Kim and Pete started working with us about a year in advance to plan for their wedding. 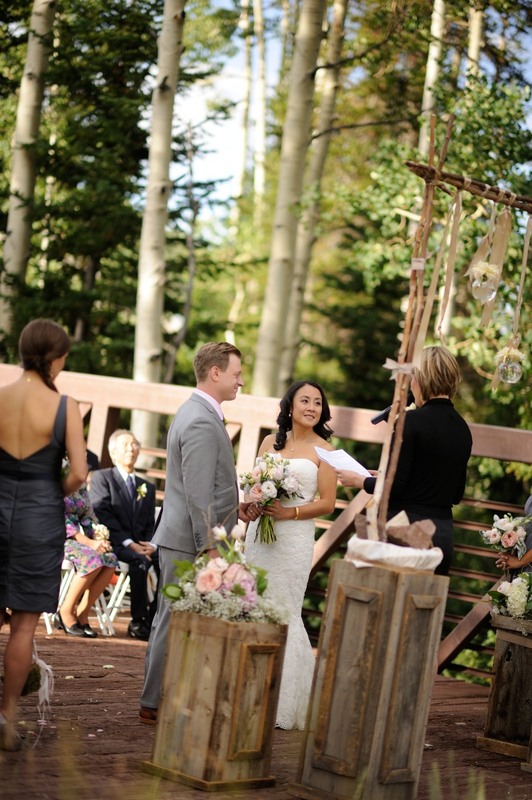 The two really triumphed with bringing pieces of their personal style, culture and personality to the rustic mountain setting. 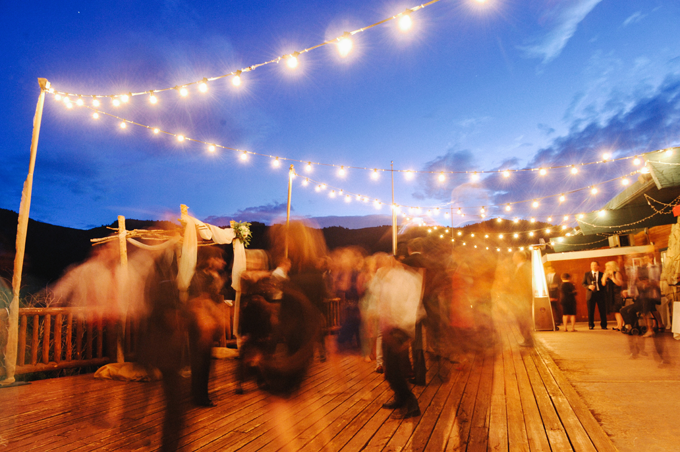 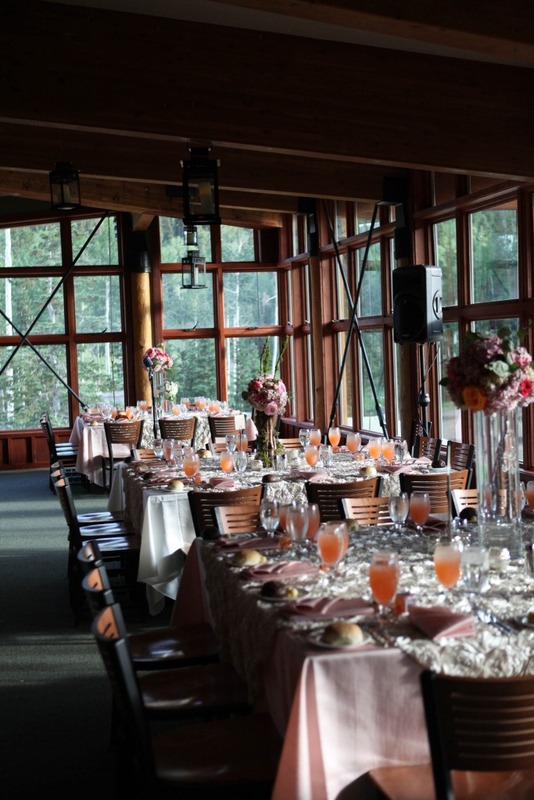 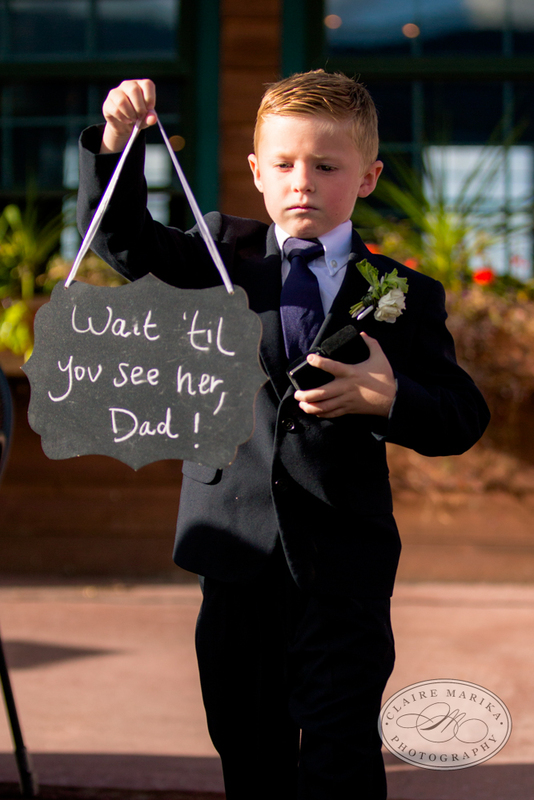 This entirely outdoor event at Red Pine Lodge was able to capture a lot of that advice. 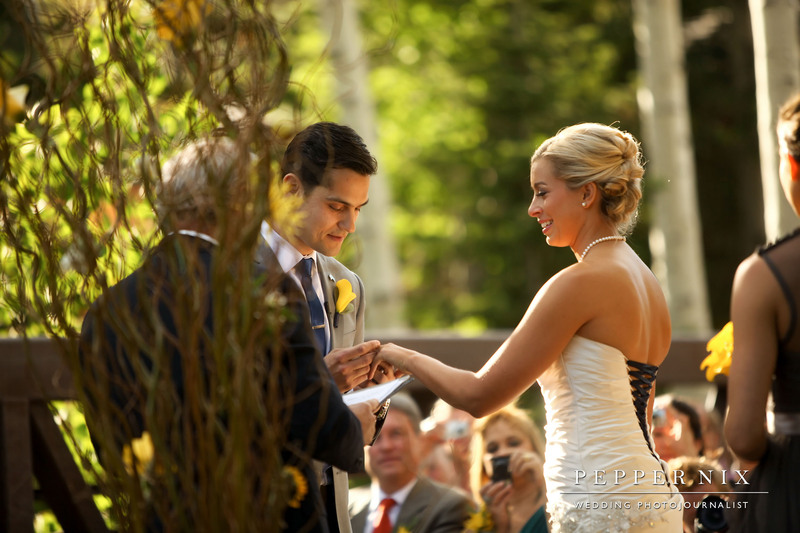 Kim definitely focused on some details that were important to her by having custom-made cufflinks for Pete in the shape of peanuts. 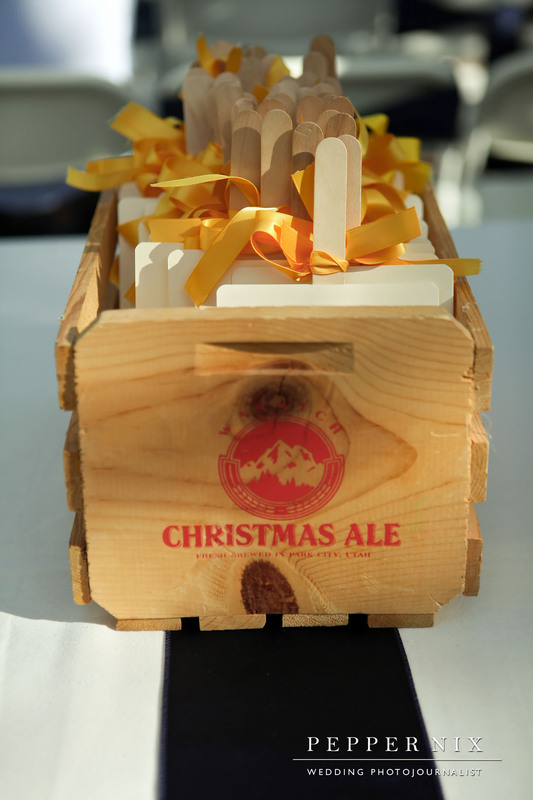 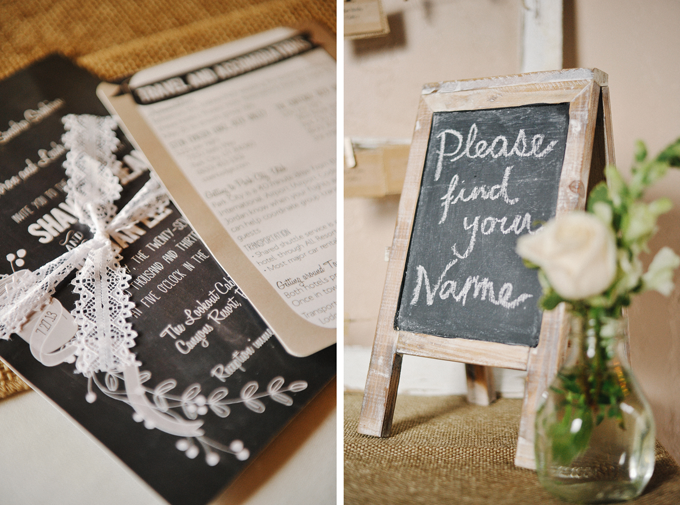 She also brought in some authenticity of the area and her sense of humor by creating wooden wedding invitations, table cards and bar menus. 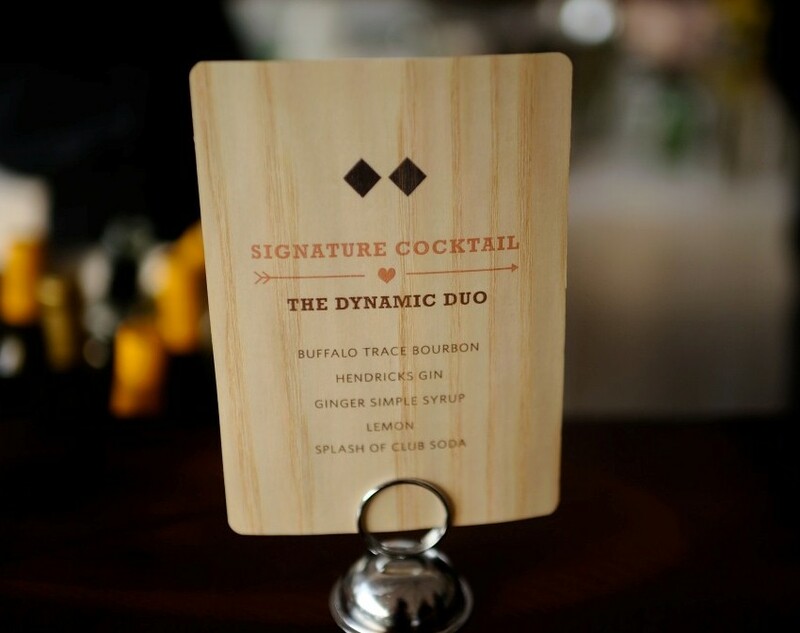 The table cards and bar menus had a ski theme – table cards were local Park City ski resorts and the bar menu used the ski trail difficulty signs (green circles, blue squares and black diamonds) to indicate the potential “potency” of each beverage type. 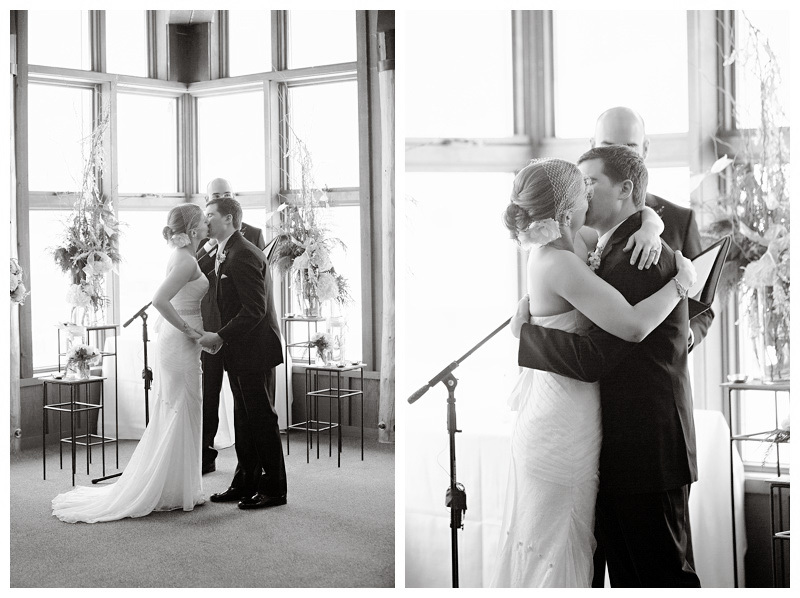 These incredible images provided to us by David Newkirk Photography. 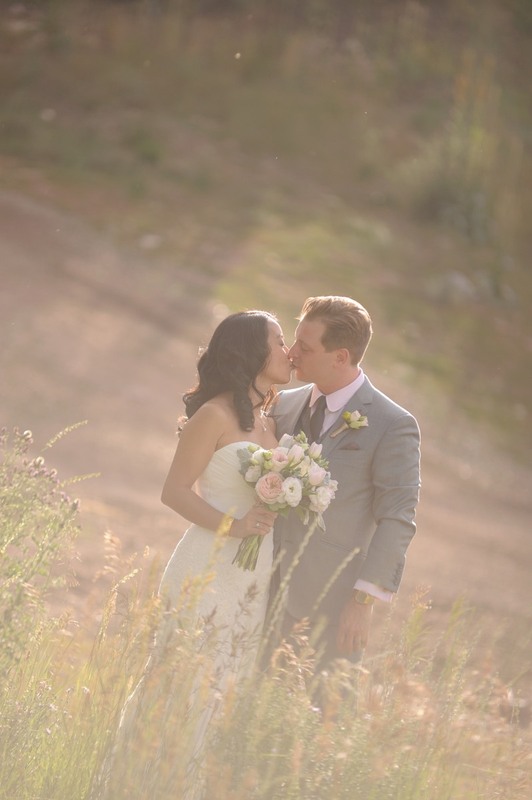 As soon as I saw the proofs from Ben and Richelle’s wedding from this past July, I knew I had to share these on our blog. 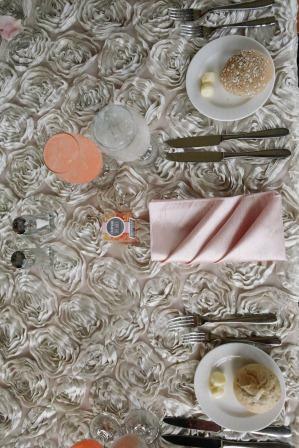 I absolutely love how soft and romantic their details were. 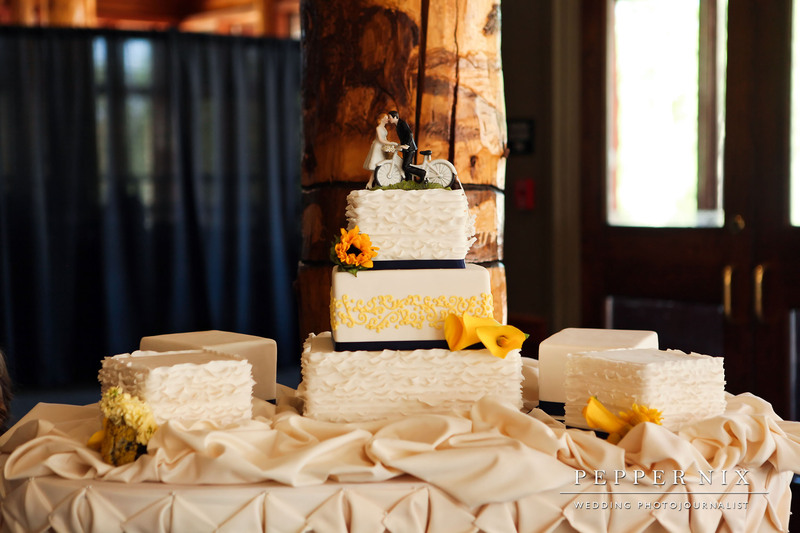 With the help of Harvest Moon, I think that they were really able to pull together something dreamy and rustic at the same time. 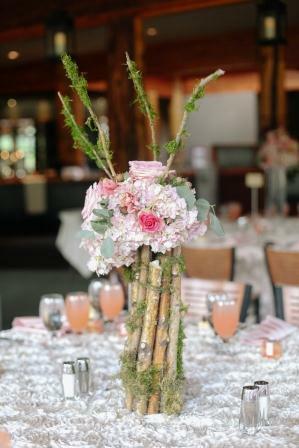 The look is very cool and unique, and shows a very tasteful way to bring both male and female energy to this event design. 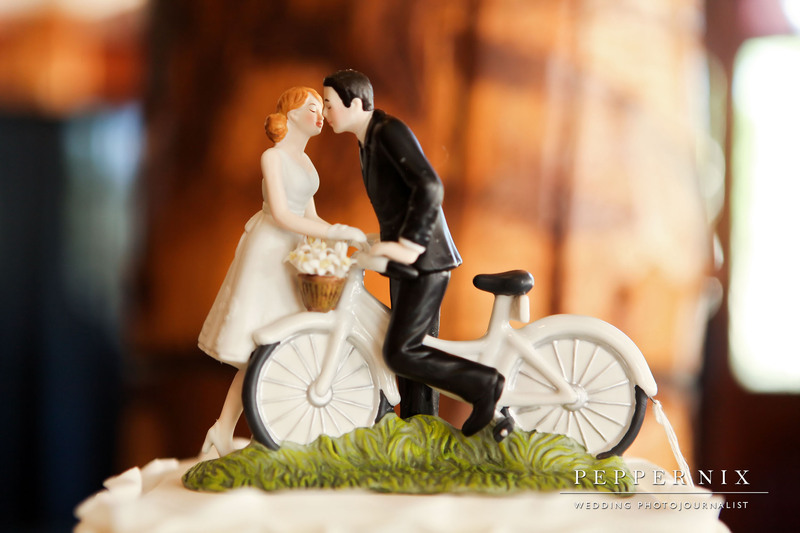 I think we can allow the images tell this love story best. 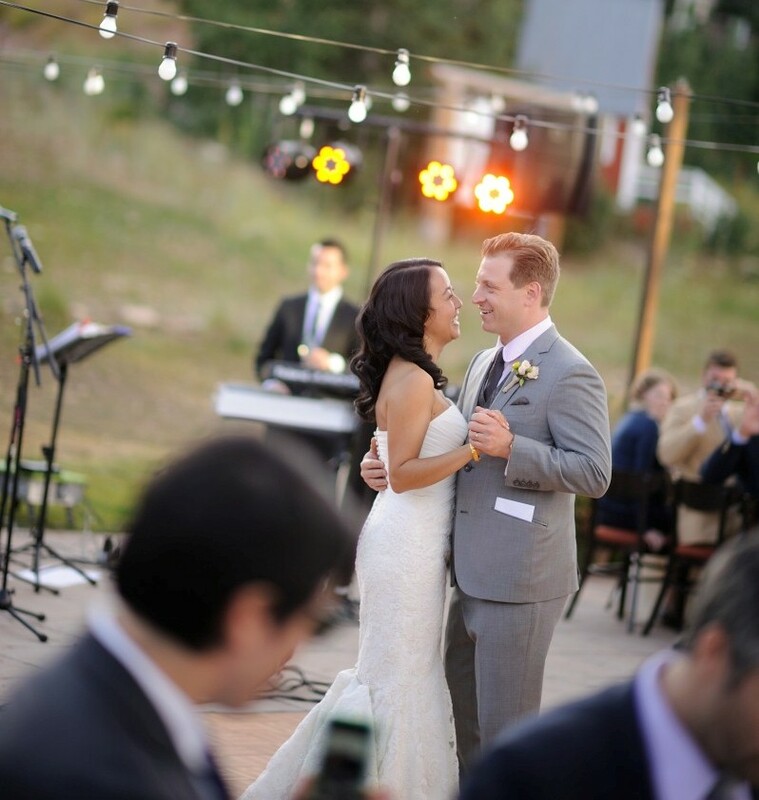 Thank you to Jacque Lynn Photography for sharing with us! 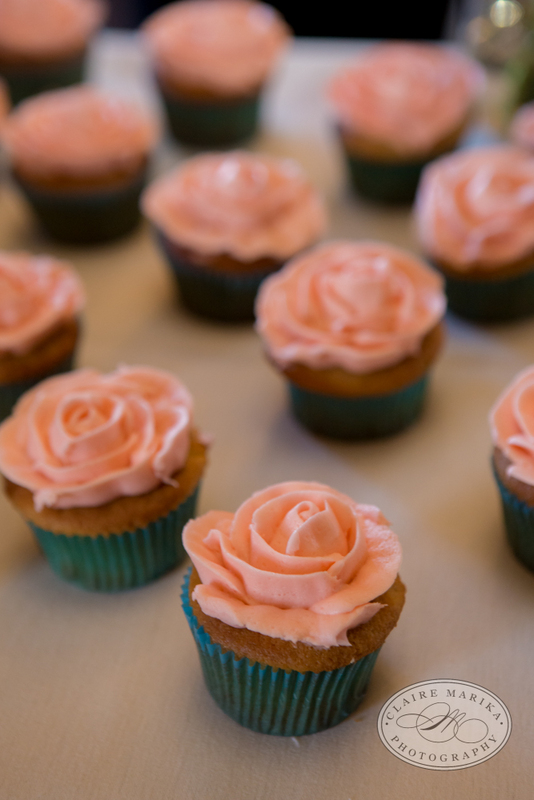 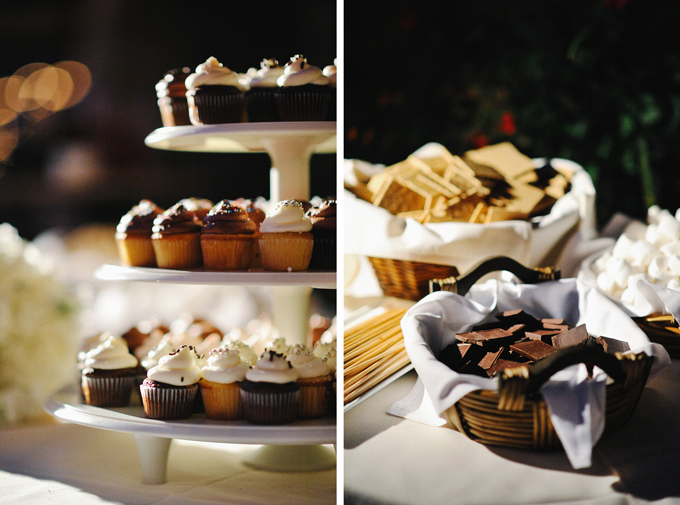 Another very cool aspect to this wedding was the food. 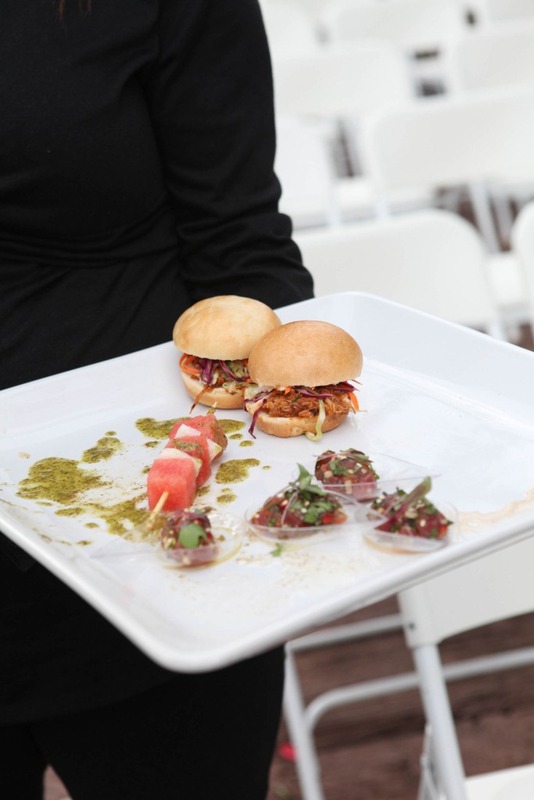 Ben and Richelle wanted to meld their two cultures into their wedding menu, which featured a combination of Mexican inspired kosher dishes. 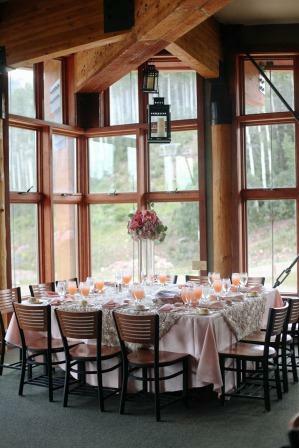 As always, our Canyons Team was happy to get creative and design a spectacular menu with the couple. 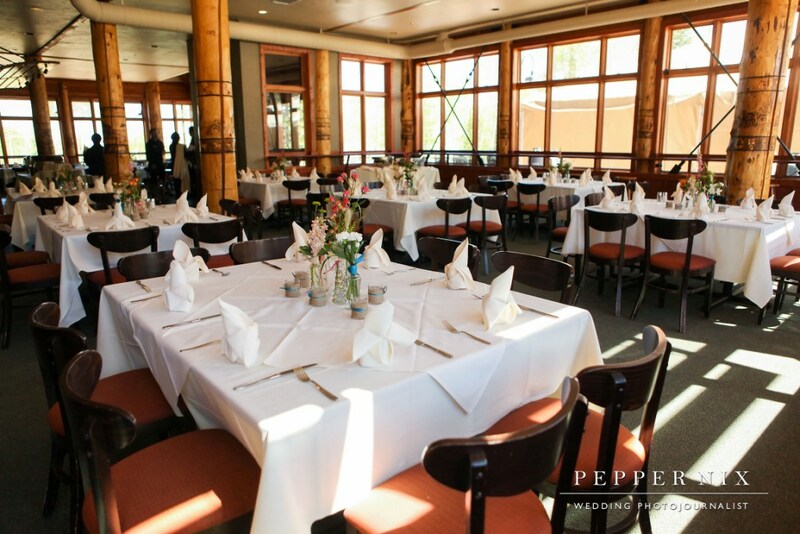 Menu: BBQ Pulled Chicken Sliders, Tuna Tartar and Watermelon with Jicama Skewers to start; Chipotle and Honey Glazed Rib Eye Steak, Ancho Crusted Utah Trout and Eggplant with Manchego Chili Relleno, accompanied with southwest inspired side dishes like roasted sweet corn and hominy succotash and red pepper cilantro puree. 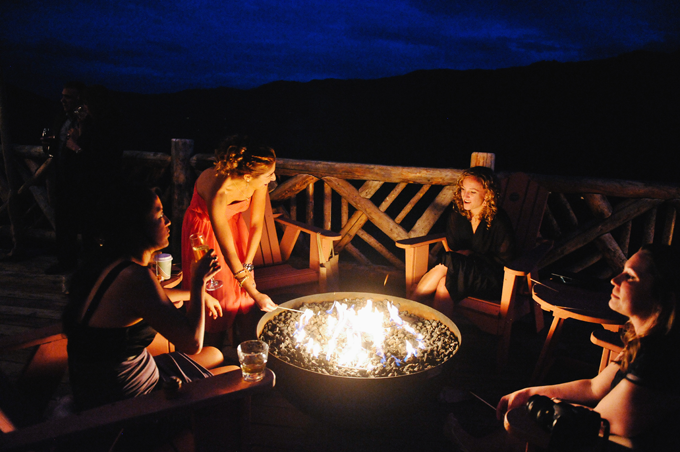 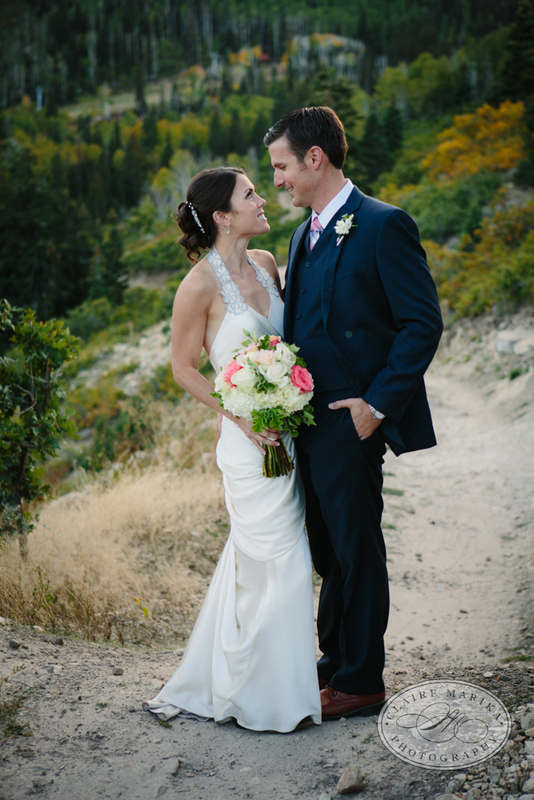 We had the pleasure of working with Park City locals, Erin and Damon, on their fall wedding at Lookout Cabin. 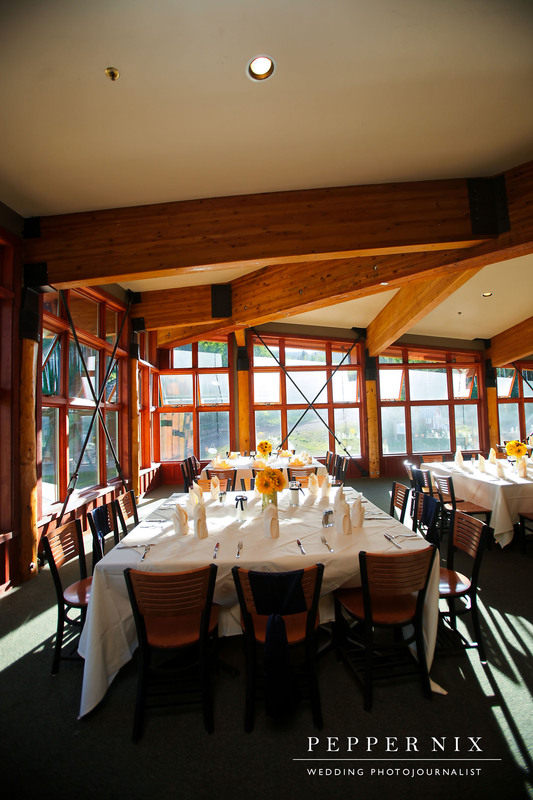 Along with their 80 guests, they were treated to one of the most beautiful fall days all season. 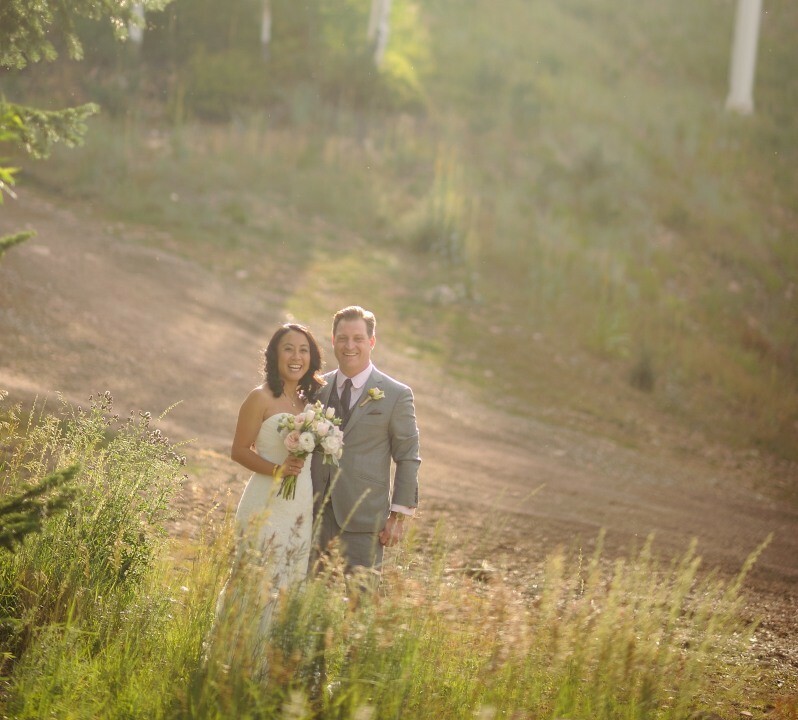 This wedding stands out in my mind as truly capturing the rustic chic style of a mountain wedding, with some Park City local flare. 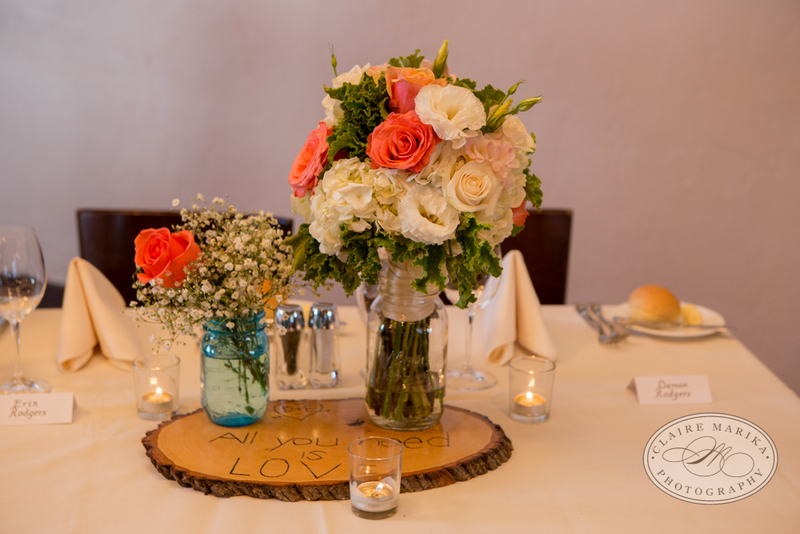 The couple used some great DIY touches like their table numbers that were wood burned onto tree stumps, and then paired them with blue glass mason jars with softer roses and baby’s breath. 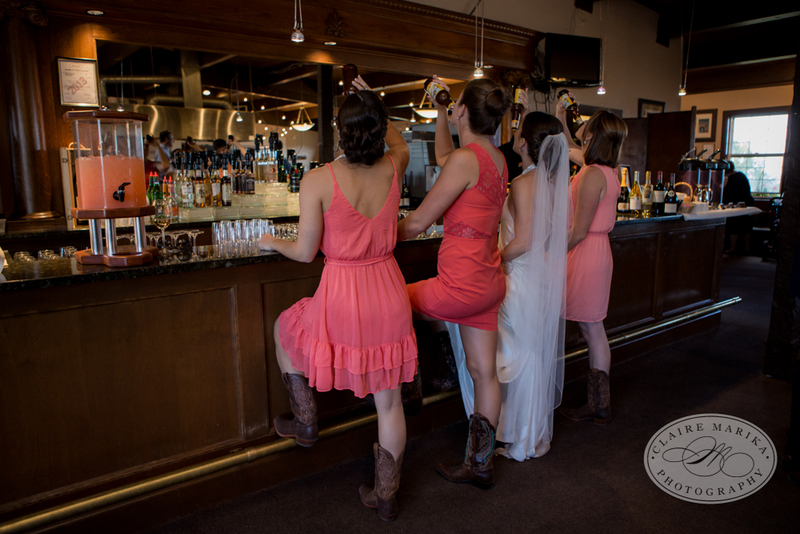 In keeping with the rustic theme, both the bride and bridesmaids wore cowboy boots with their dresses. 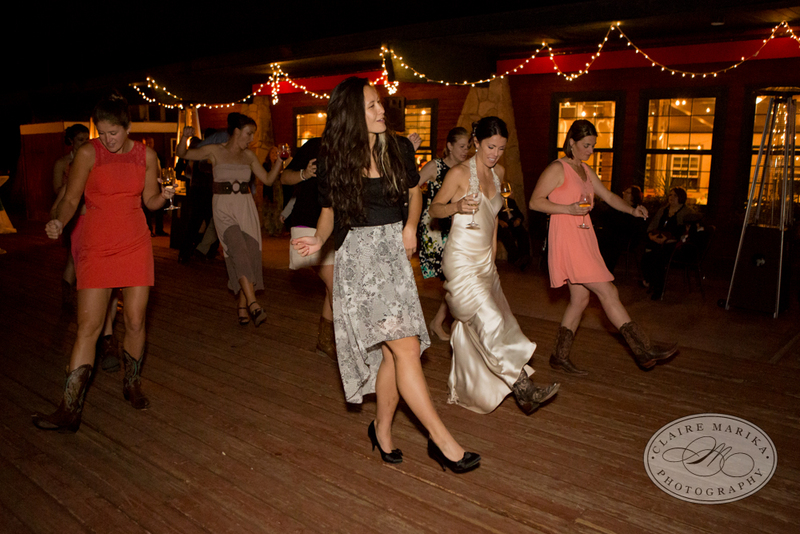 Line dancing and s’mores around the fire pits finished off the evening. 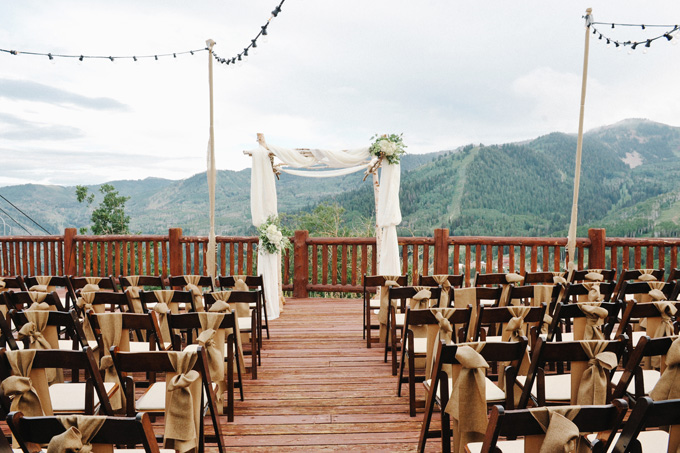 The juxtaposition of the rustic mountain touches with the softer more romantic colors and textures really define this trend. 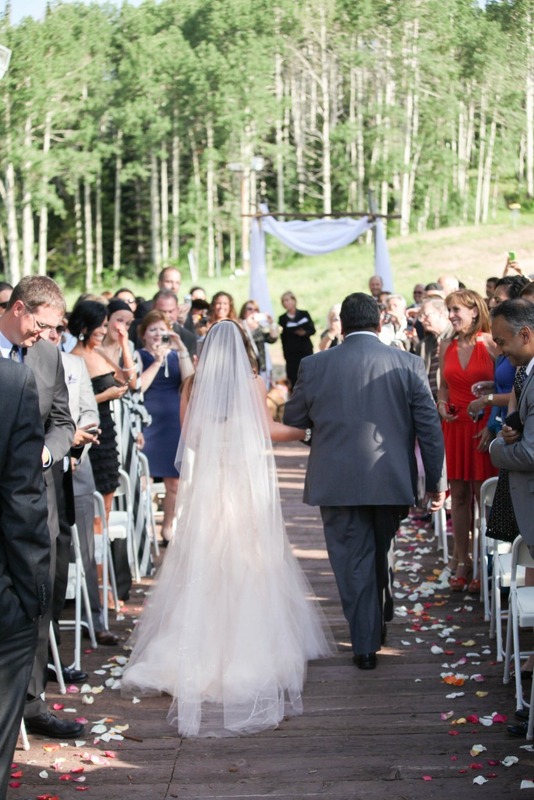 Claire Marika Photography was onsite to capture this spectacular event. 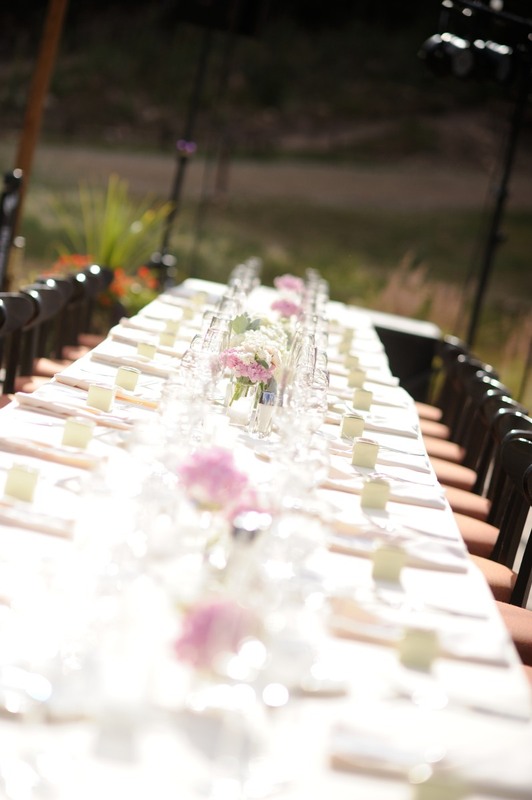 Menu: The dinner menu featured a mixed green salad with candied walnuts, poached pear and utah goat cheese; a duet entree of tenderloin of grilled beef with cognac butter poached shrimp. 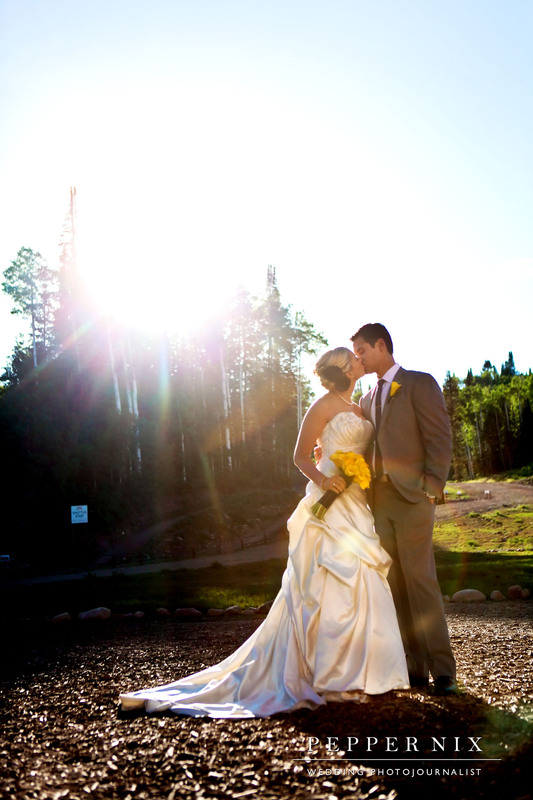 Our Canyons Wedding Team works very hard to make the wedding planning process a simple and enjoyable experience. 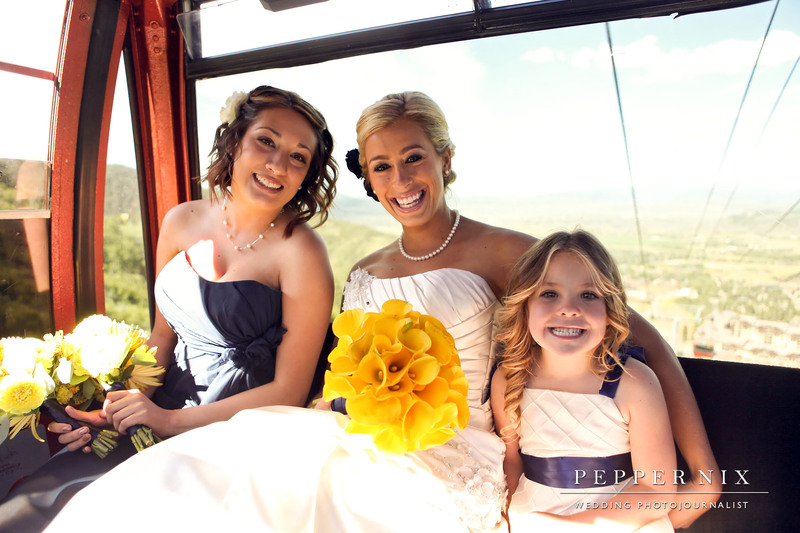 In doing so, we have designed several different levels of wedding packages for our couples to select from. 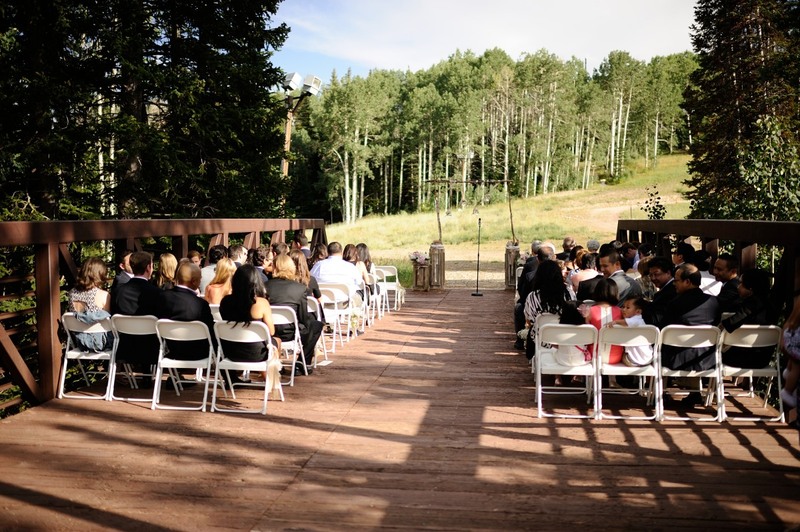 But, we also strive to make every wedding feel unique and special for those bride and grooms. 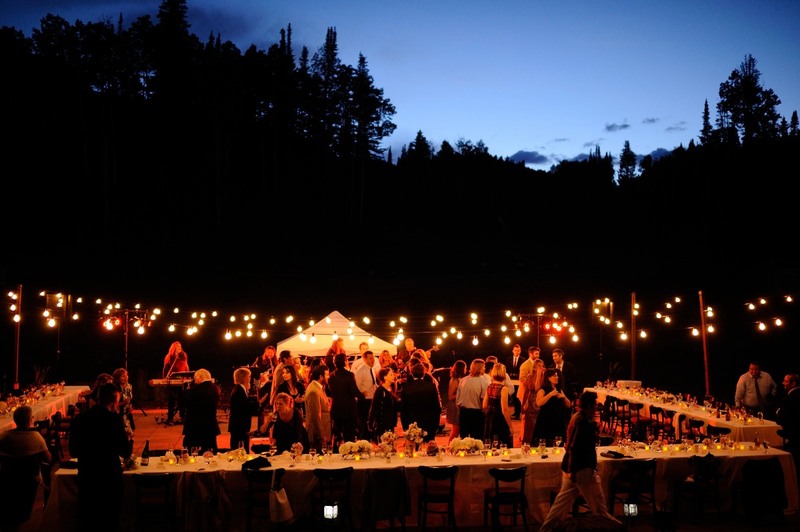 Many couples have ideas when it comes to food, wine, special touches to a timeline or setup. 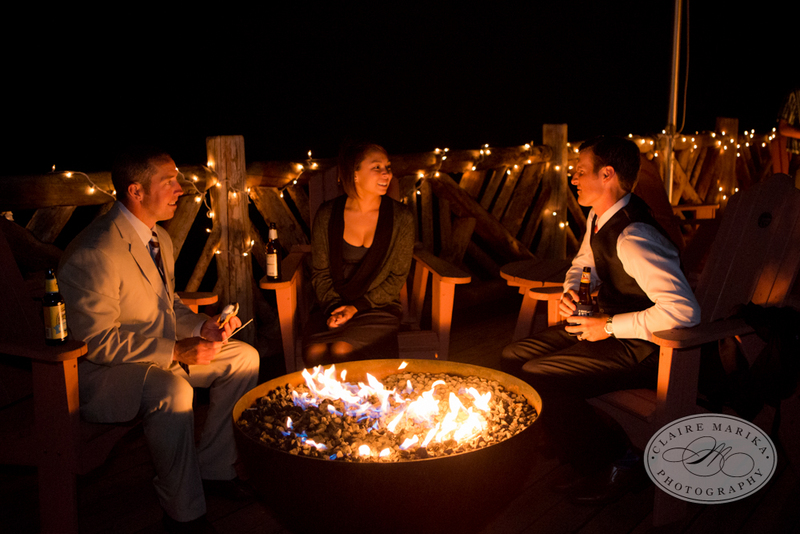 Our Team is more than happy to offer creative suggestions to help put a couples’ personal spin on one of our packages or to totally customize. 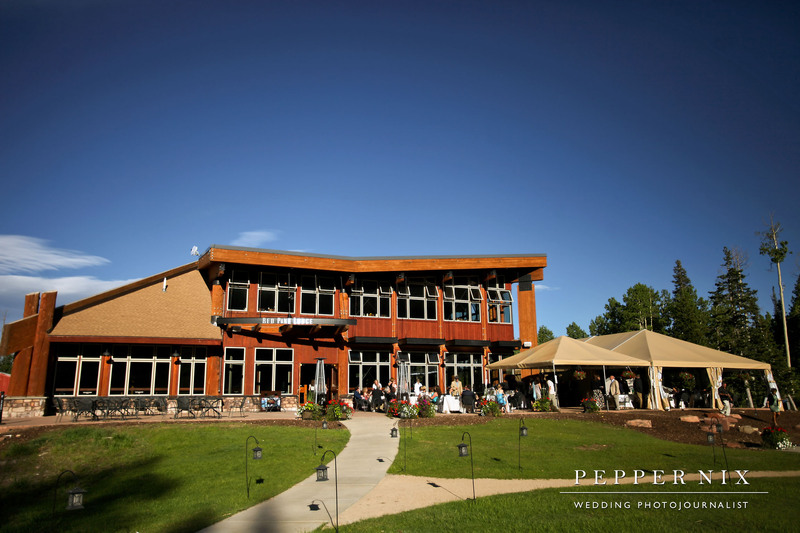 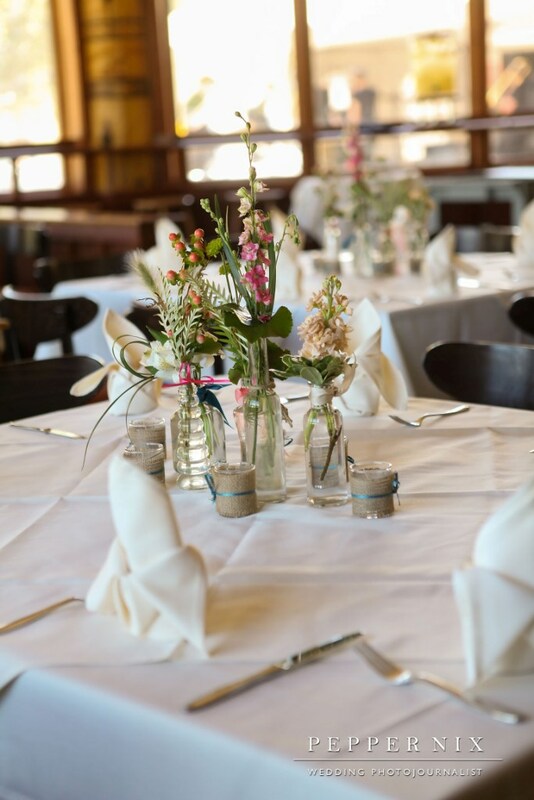 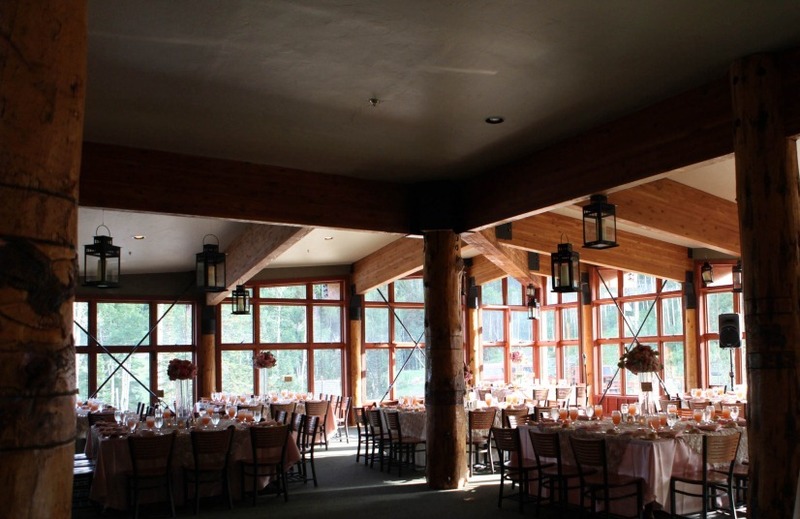 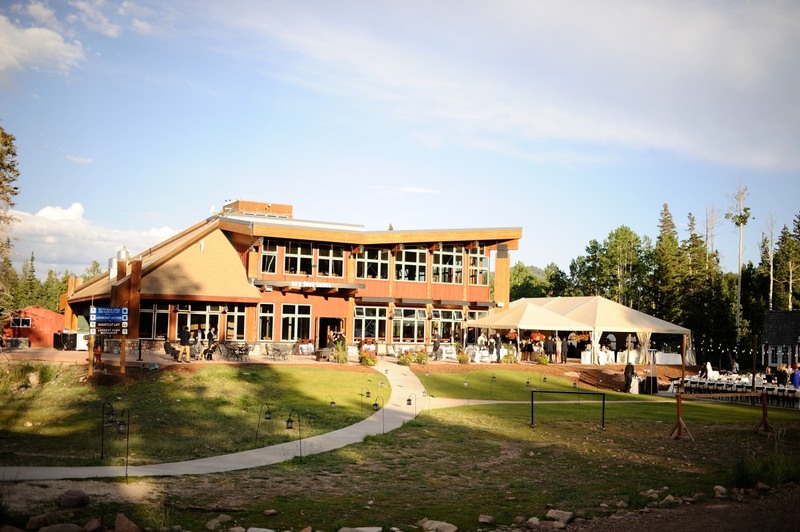 Lydia and Tim definitely made Red Pine Lodge their own by walking away from our package plan and custom designing their event with our Event Managers. 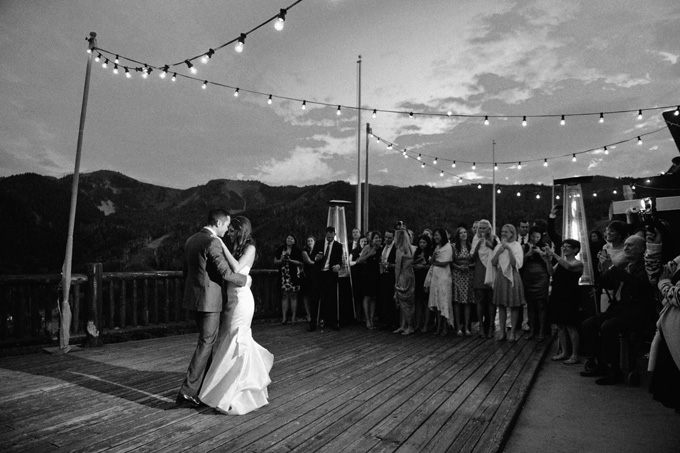 Their approach inlcuded a different ceremony and cocktail hour location than we would typically use, as well as a black and white checkered dance floor rental. 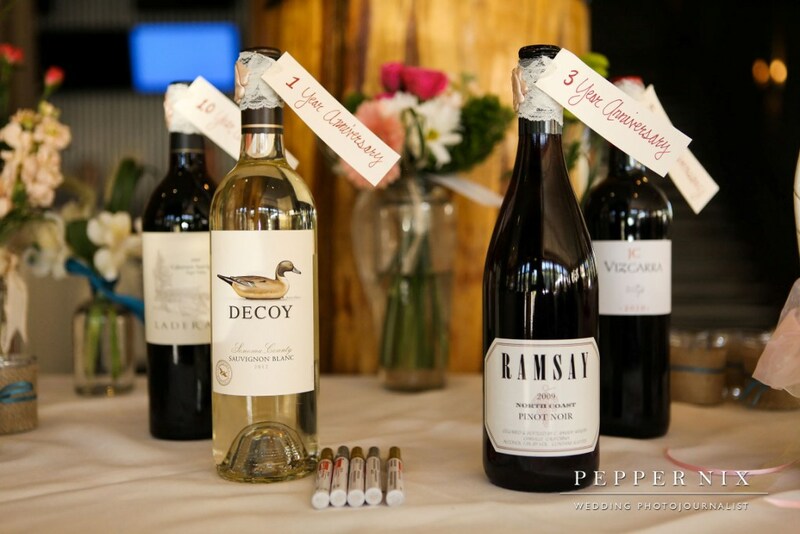 They had a great idea to use different bottles of wine for their guestbook that would be opened for future anniversaries. 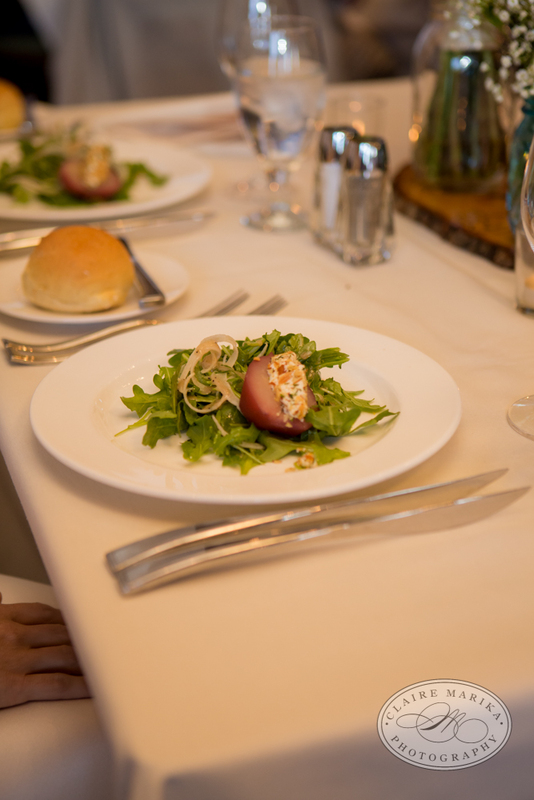 In addition, they added a southern inspired twist on our menu for the evening, and created a “tunnel of love” send off to the gondola to cap off the event. 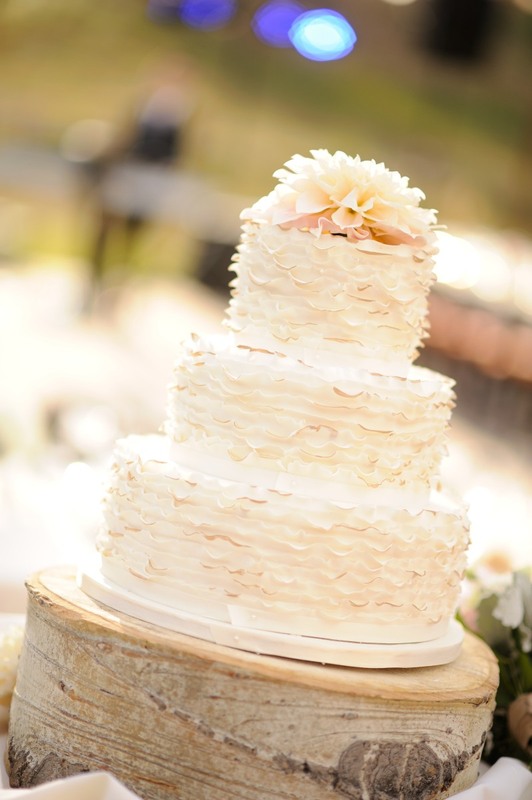 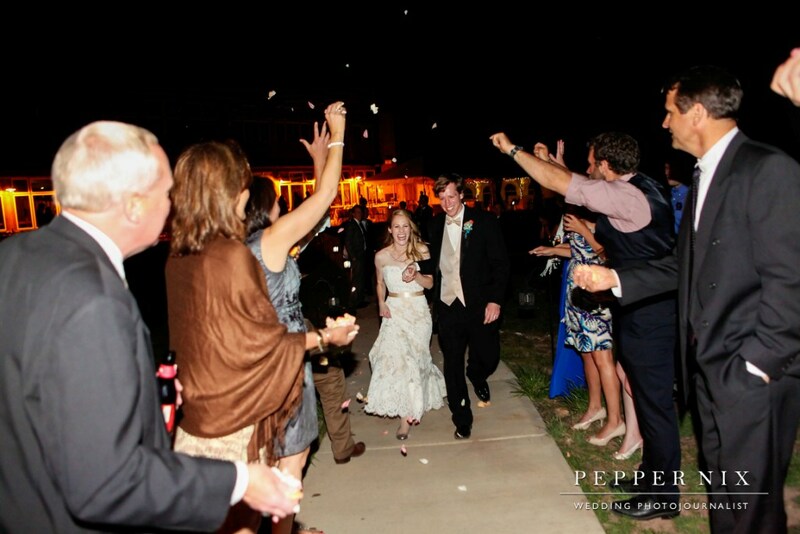 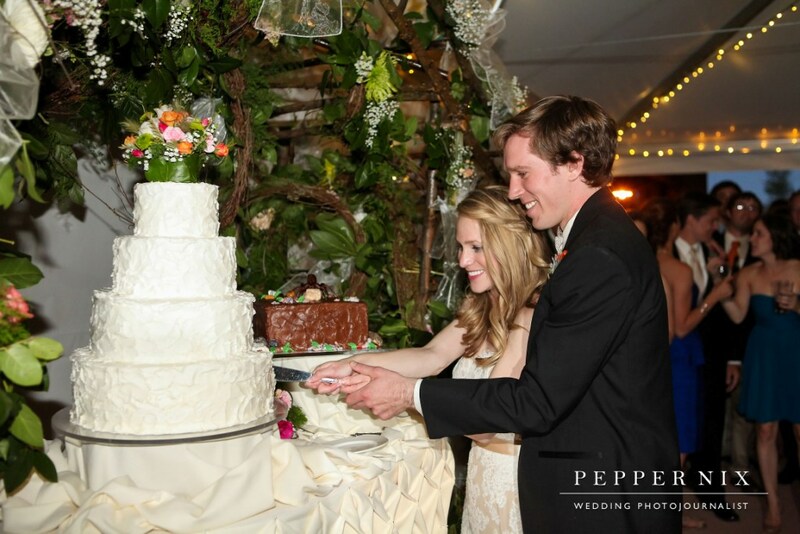 Thank you to Logan Walker with Pepper Nix Photography for sharing this awesome June 2013 wedding with us. 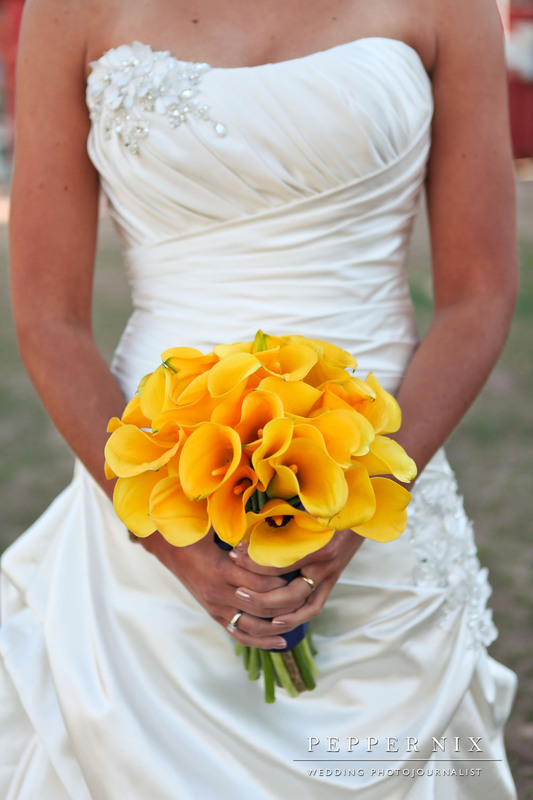 We asked Lydia what her favorite detail from the wedding was, she she said, “My favorite detail was the groom (and groomsmen) flowers. 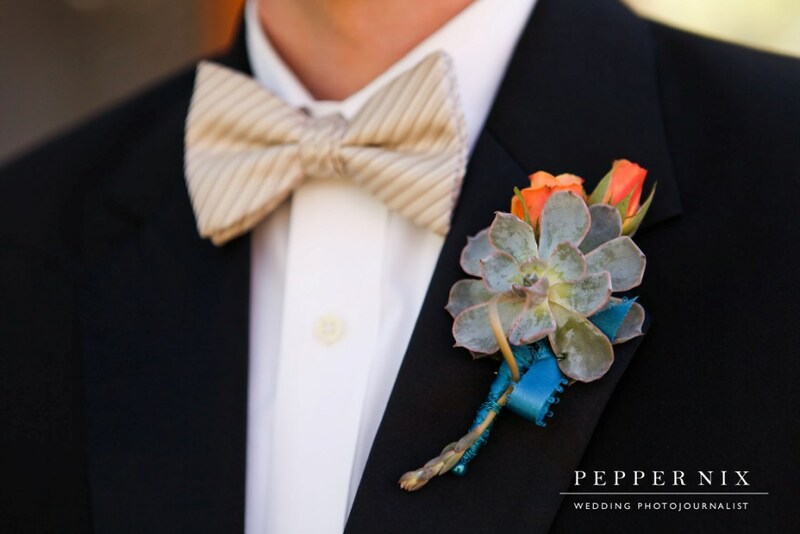 We saved the succulents and replanted them — the groom’s survived and is growing! 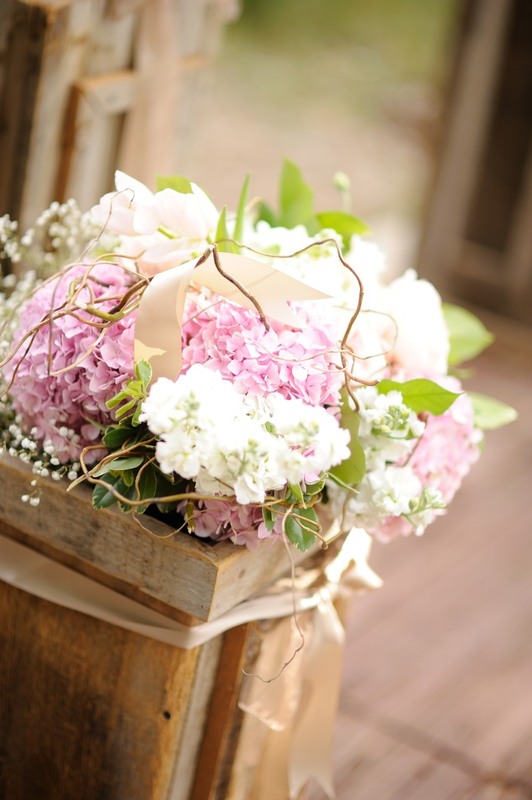 It’s something special to have beyond the wedding and to watch it grow… etc.” Great advice for any couples out there with a green thumb! 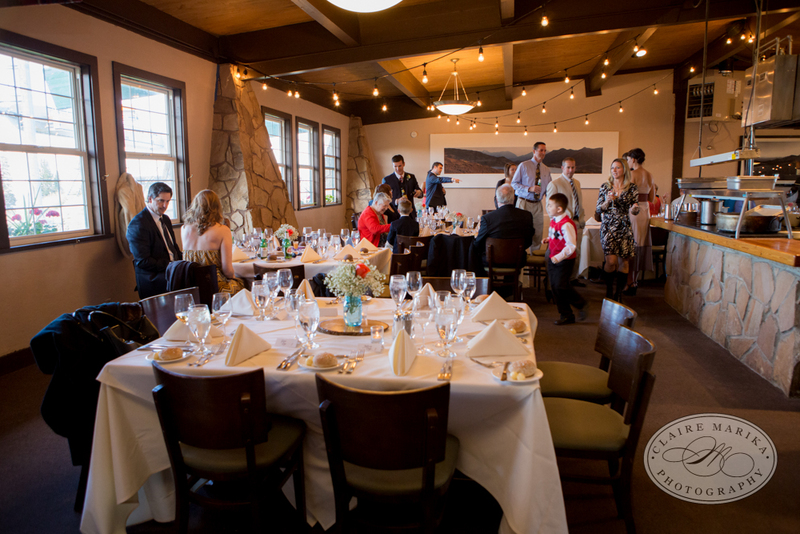 Catering/Menu: Canyons Resort helped to customize a menu that featured a live action seafood station with Shrimp and Grits, as well as clams, mussels and scallops, as well as Crisp Maple Leaf Farms Duck Breast with Dried Apricot Brandy Glaze and a Garlic Seared Swiss Chard and Truffled Asparagus Risotto. 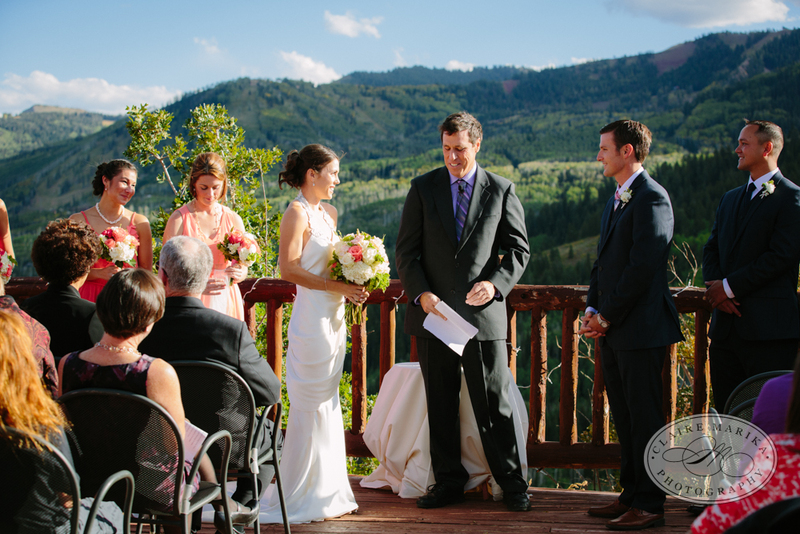 There are few locations to select for a mountain destination wedding that would offer the same experience that Lookout Cabin can provide. 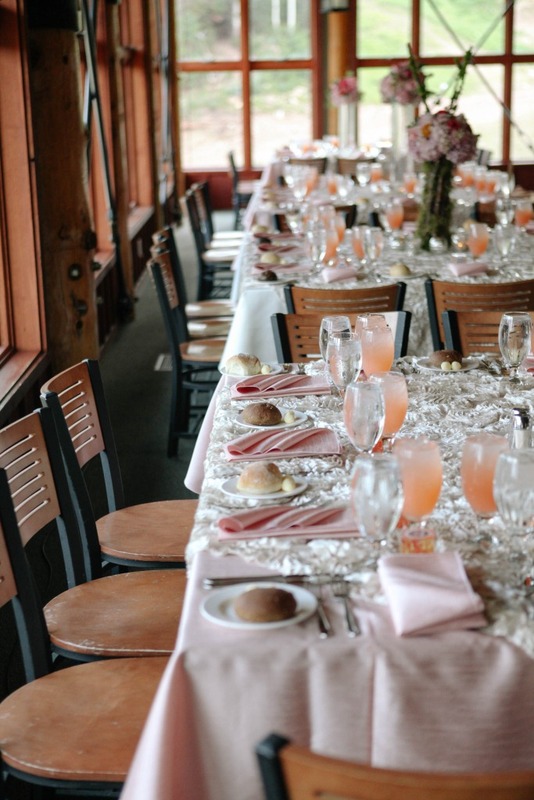 The combination of the view from Lookout Peak, the rustic outdoor setting, intimate cabin indoor setting, and incredible views from the Orange Bubble Express that brings guests from the base of Canyons Resort to the wedding venue, make this such an ideal setting for our destination couples. 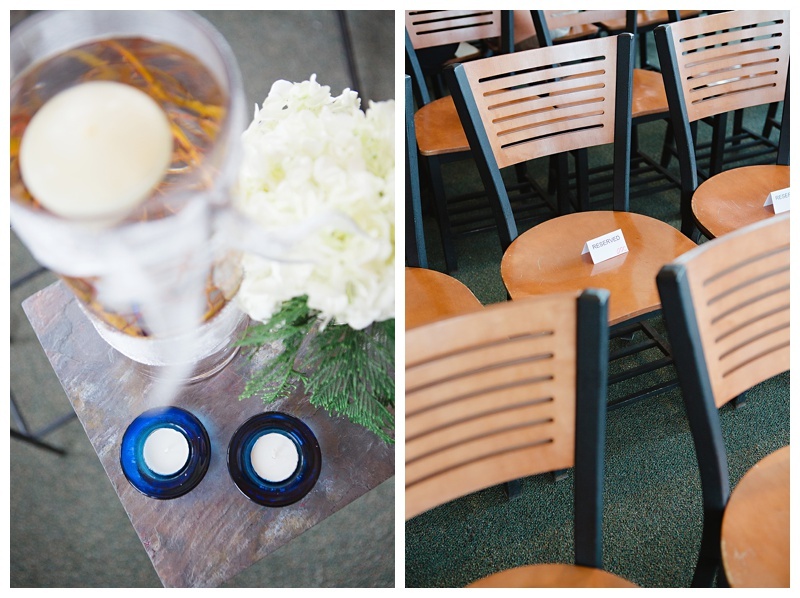 The whole experience tends to blow the minds of our “coastal” wedding guests. 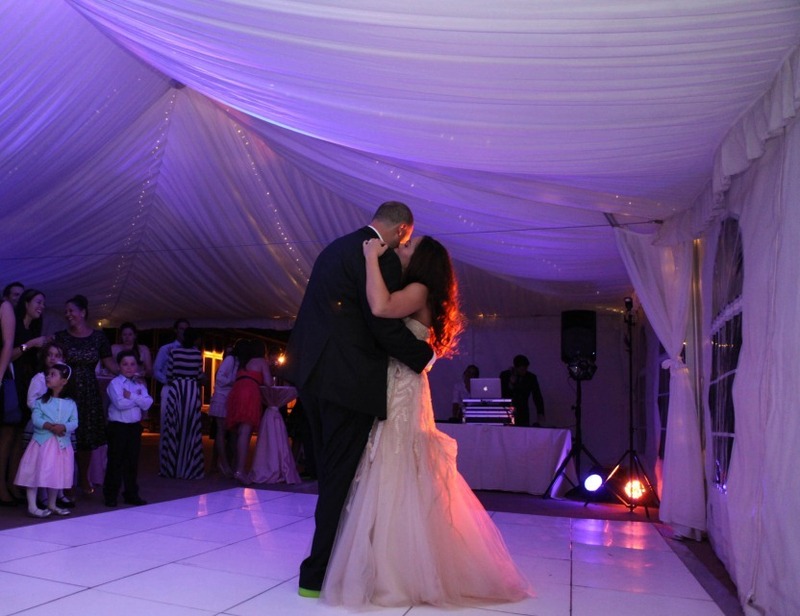 Based in New York City, Shavara and Jordan decided that was exactly what they were looking for when planning their wedding for July of 2013. 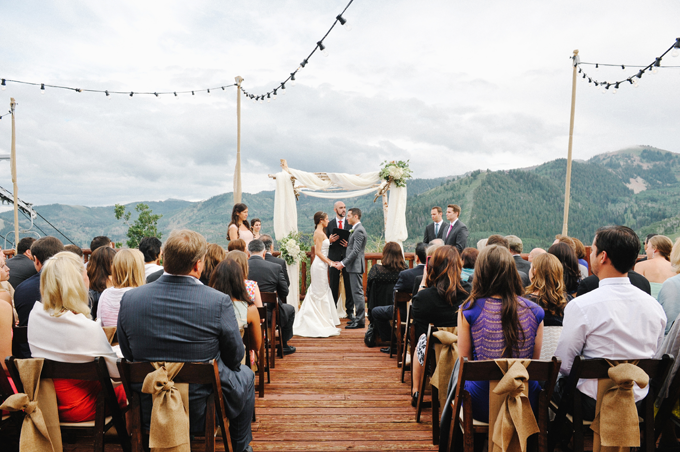 They needed a venue to truly capture the essence of a mountain wedding. 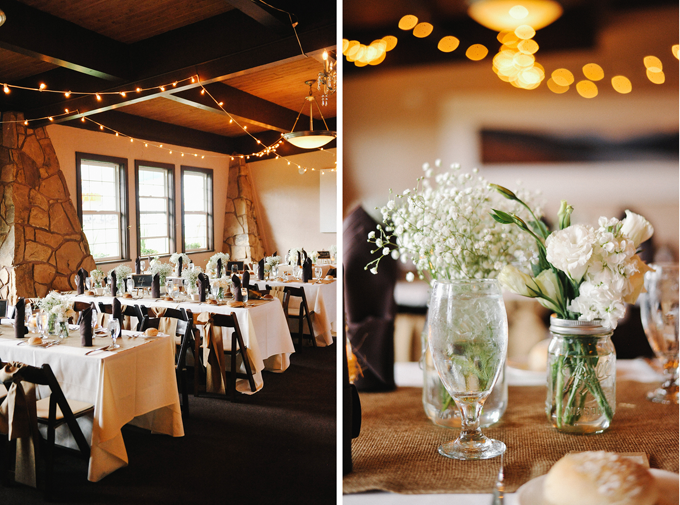 These images from Rebekah Westover show what a treat this experience was for the couple and their guests. 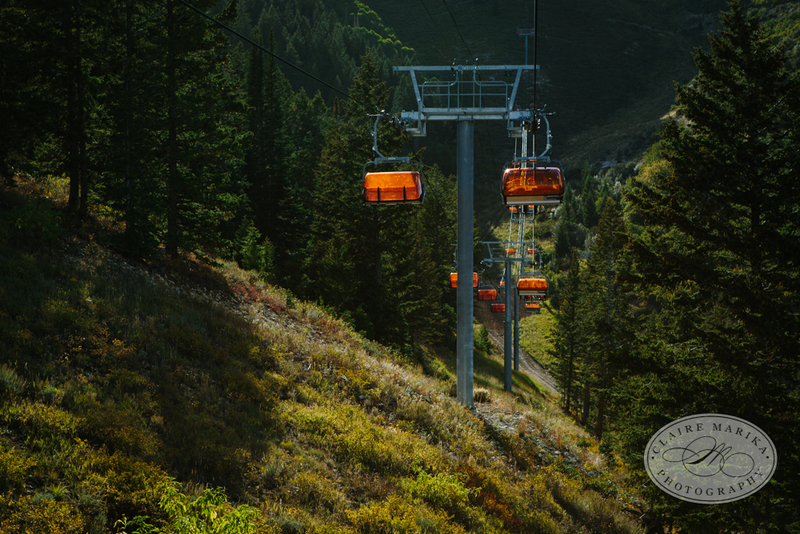 We asked Shavara what her favorite part of the whole experience was, and she said, “I think the most memorable part was the chairlift down. 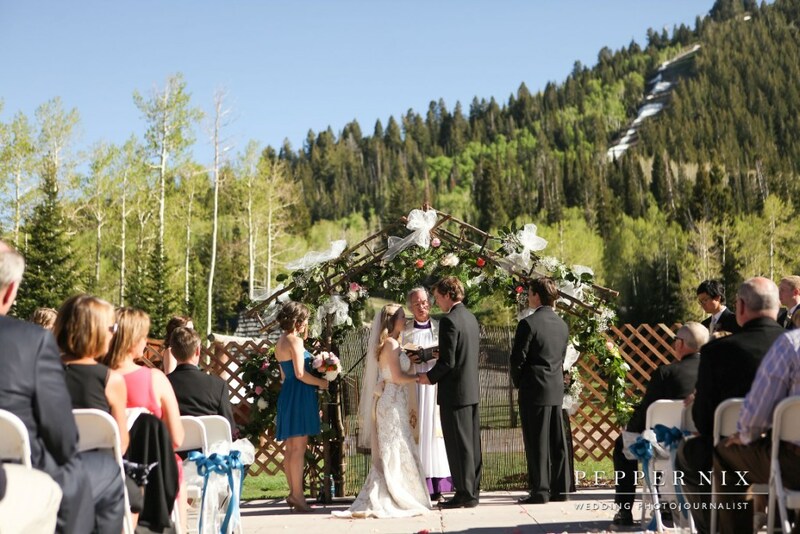 It was great to have that time to recap the night.” I am sure that chairlift ride at night with a view of the whole town lit up, was probably a very memorable experience and once in a lifetime for most of her wedding guests too. 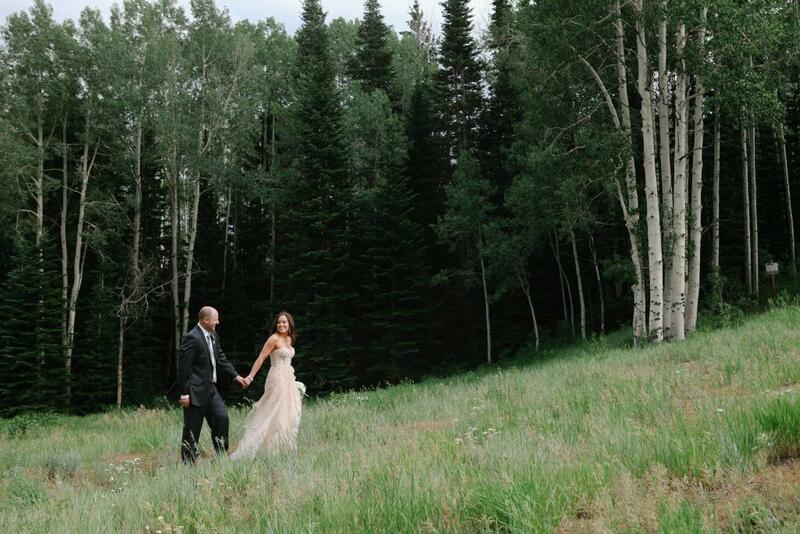 Thank you to our partners for making this wedding a beautiful success!